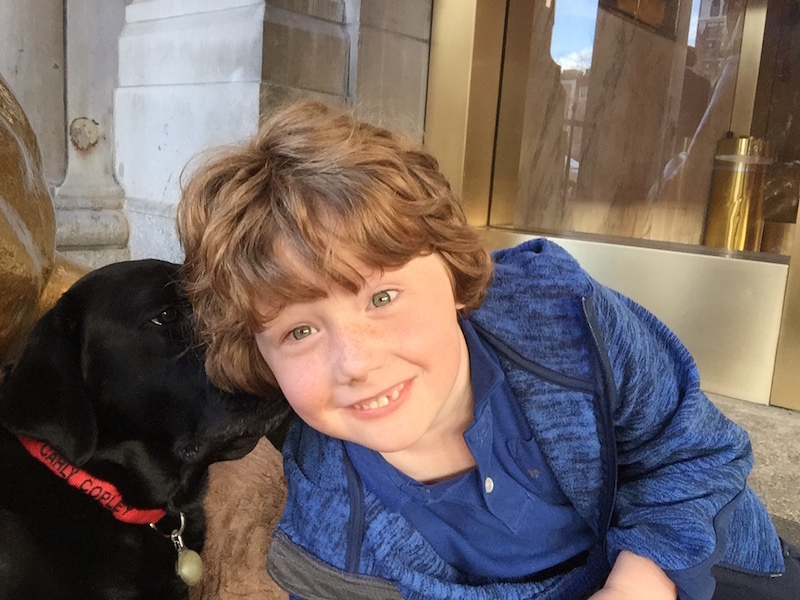 When we first entered the Fairmont Copley Plaza Boston, I wondered if it would be an okay hotel for kids. I kept looking around at all the beautiful art and breakable things and seriously considered coming back another time without my son. As we rounded the corner into the reception area of the lobby, I realized how wrong I was as Will was welcomed with open arms and even a lick. Opened in 1912, the Fairmont Copley Plaza is a landmark in Boston. 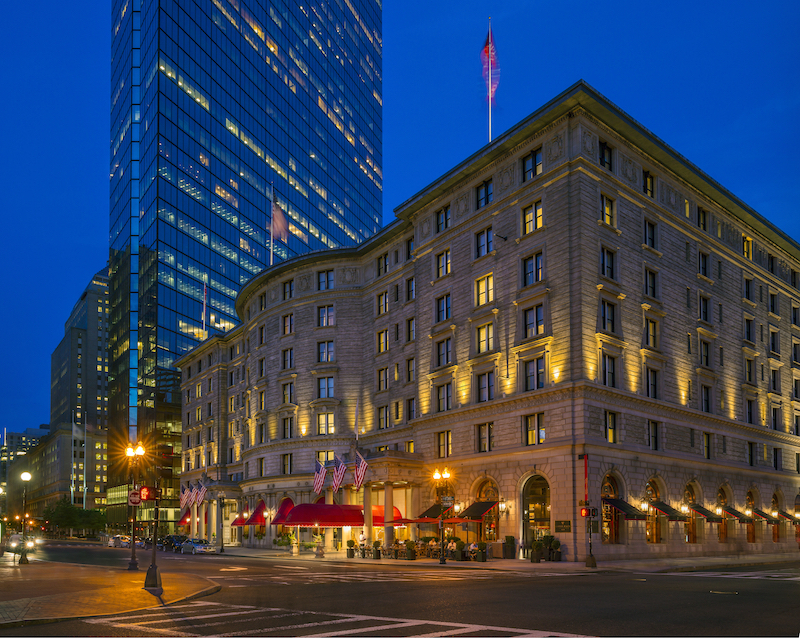 Located in Back Bay, the hotel sits next to the Boston Public Library and within walking distance to the Boston Public Garden, Boston Common and the historic Freedom Trail. Although the hotel has been around for a while, it is in pristine condition thanks to an over $20 Million dollar restoration and renovation that was completed in 2012. When I said Will was welcomed with a lick, I meant it. 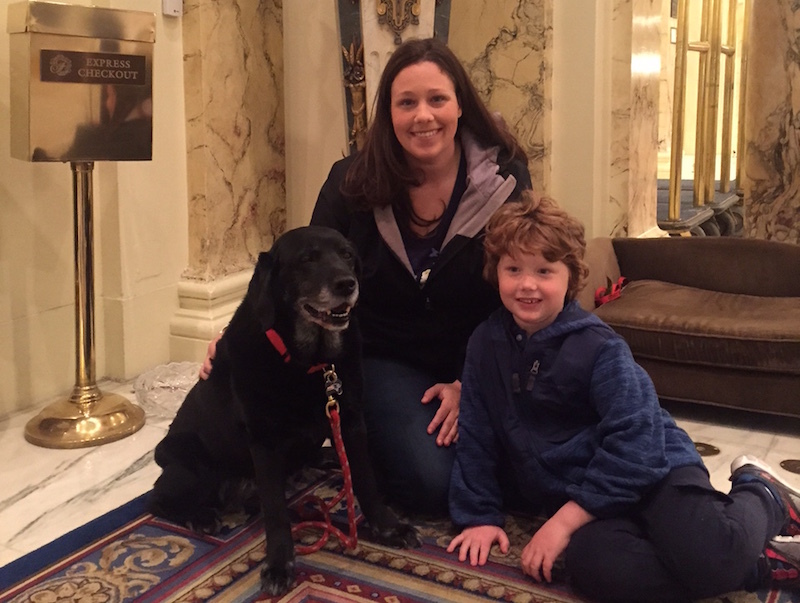 Both Will and I were so surprised and excited when we first saw one of the Fairmont Copley Plaza’s two Canine Ambassadors. Will immediately sat down next to Catie Copley, who is arguably Boston’s most famous canine, and the two became fast friends. Catie ended up at the hotel after going through Guide Dog training to be a seeing eye dog and then ironically failing the vision test. Catie found her way to the Fairmont Copley Plaza instead where she has been working for over 10 years. Beyond the world’s cutest hotel employees, the Fairmont Copley Plaza Boston is extremely kid-friendly. While on property, I likened it to the classic Eloise tales. Every staff member we came across engaged with Will and showed him unique and cool aspects of the hotel and city. The in-room dining featured a well priced kids’ menu with a good selection for adventurous eaters or picky kids like Will. The room itself had two big beds and a well sized sitting area for kids to chill out. The hotel also has an arrangement with Boston babysitting company Parents in a Pinch and can arrange childcare during the day, at night and on weekends and holidays starting at $15 per hour (plus a placement fee). What struck me most as a parent staying with a child at the Fairmont Copley Plaza was how many incredible kids’ activities were within a reasonable distance to the hotel. 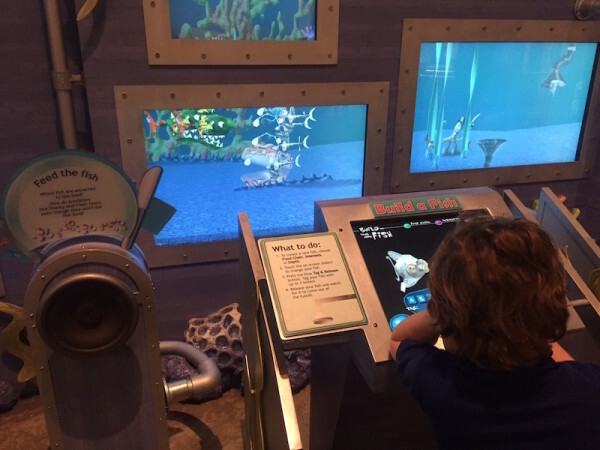 Although we had a short time in Boston, we were able to do quite a few kid-friendly activities due to the proximity of the hotel to the rest of Boston. When you step out of the Fairmont Copley Plaza, the Boston Public Library is hard to miss. The building itself is stunning and even Will was blown away by the architecture and history. The library was in fact the first free public library in America. The Copley Square location has been in existence since 1895. To this day, library card holders are allowed to take out 75 books at a time. The great thing about the location across from the Fairmont Copley Plaza is the amount of free kids programming. These include drop-in playtimes, movies for kids and science programming. An easy walk from the hotel, the Boston Public Garden is a beautiful park and historic Boston landmark. Will loved checking out the buildings surrounding the park, feeding the ducks and seeing the historic markers and statues. 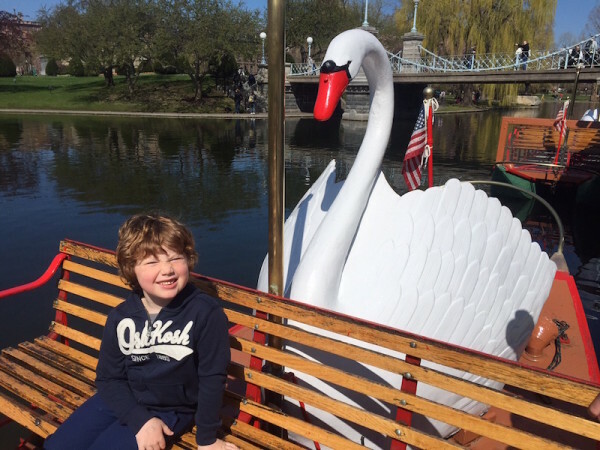 Then he saw the Swan Boats. In operation since 1877, the Swan Boats are essentially a bicycle boat mash-up whose paddles sit on a wheel that is foot propelled like a bicycle. We loved our time on the boat seeing ducks, getting a glimpse of each corner of the park and enjoying the sun. Best of all tickets are extremely well priced at $3.50 per adult and $2.00 per child over 2. Babies and children under 2 are welcome and ride for free. A definite not to be missed Boston experience. Boston Common itself is incredibly cool for kids especially if you stop by the Boston Common Visitors Centre and meet the tour guides. 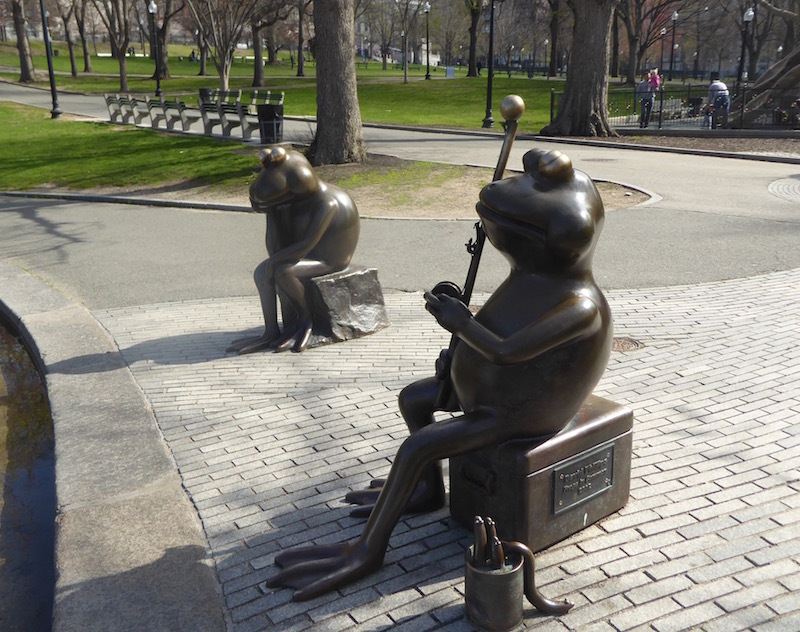 Once you’ve explored the Freedom Trail and the grounds, head towards the Boston Common Frog Pond most easily spotted by looking for the carousel. The Frog Pond is many things transforming with each season from a skating rink in Winter, a reflecting pool in Fall and Spring and an awesome splash pad in Summer. There is also a very cool tadpole themed park in the area and a family friendly café. A quick cab ride from the hotel, the Boston Children’s Museum is one of the best in the country. The museum is 3 floors of fun with tons of daily activities like puppet shows and free family yoga classes. Will loved the climbing structure that fills the lobby but also enjoyed checking out all the different exhibits. At nearly 7, he was on the brink of being a little too old for the museum but kids under 6 will get a real kick out of it. Although we hadn’t planned on visiting the Museum of Science or MOS as its known, I was quite happy that we decided to in the end. 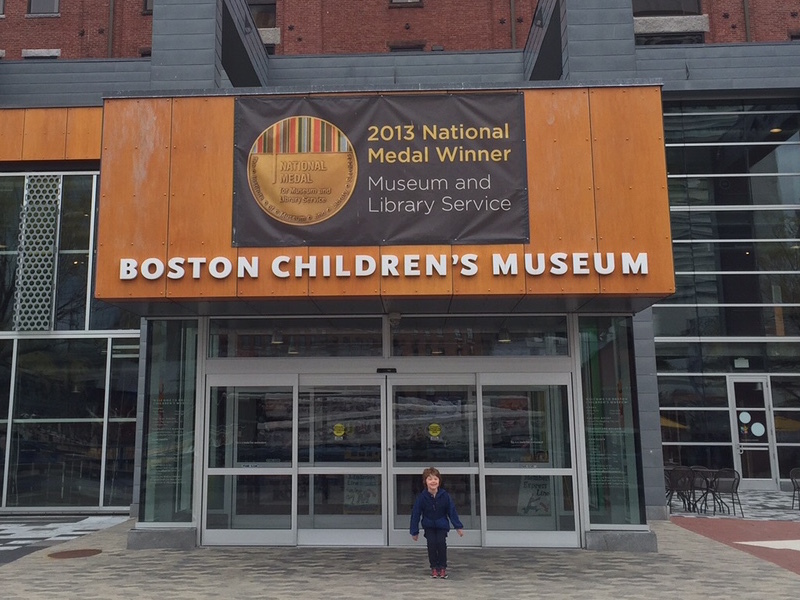 Will loves science and although we have visited quite a few science museums, he really fell for the one in Boston. The exhibits range from making your own virtual fish and releasing him into a tank of friends and predators to a daily science briefing which taught me more about the Nepal earthquakes in 10 minutes than I learned watching a month of CNN. The museum has a cool space section, a very fun science of playgrounds section, a butterfly garden and planetarium amongst many other things. Take time to engage with the volunteers who love what they are doing and will teach your kids some very cool things. We didn’t actually visit the New England Aquarium but I mention it as it is a hot spot for families. The aquarium features a huge section on penguins and has some resident seals, fish and sea turtles. They also run a well-known whale watching excursion that leaves from the aquarium with Boston Harbor Cruises. Boston’s North End is a historic district known best for its Italian heritage. 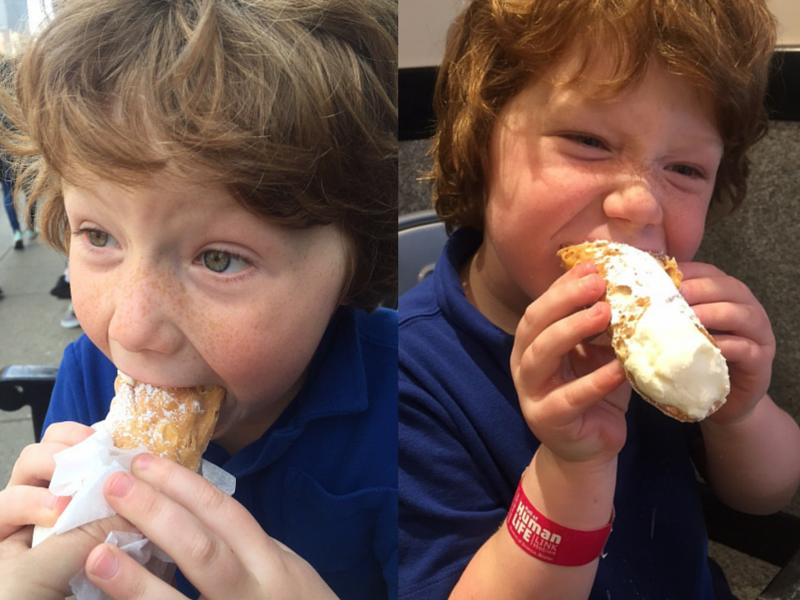 You cannot leave Boston without letting your kids try an authentic Italian cannoli. Will and I picked up two plain ricotta cheese cannolis from the two most well known pastry shops Mike’s Pastry and Modern Pastry which sit steps from each other. Locals and tourists line up for the treats and its fun to have a lively discussion with kids about which is better. Will chose Modern Pastry while I had to go with Mike’s. If headed to the North End for dinner, try the authentic Italian pizza and meatballs from Quattro, a modern looking restaurant with rustic Italian cooking. We loved every bite we took in the North End and will be back for more every time we visit Boston. 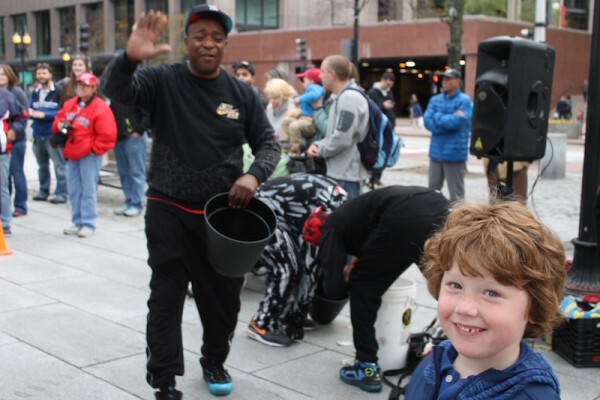 A quick downhill walk from the North End, Faneuil Hall Marketplace is a great place to go with kids after dinner to see the Buskers and Street Performers. Will was enthralled by a fun dance troupe that used humour and incredible dance skills to collect money and entertain the crowd. We wandered the property for a good 45 minutes after dinner just laughing and enjoying the variety of acts and shows. There are a number of cool shops, restaurants and open public restrooms around the marketplace making it an easy place to visit with kids. 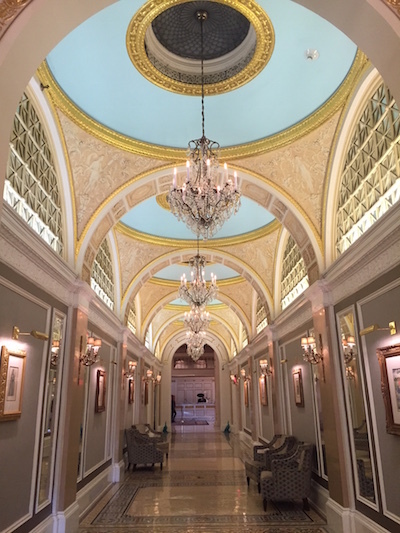 Like this review of the Fairmont Copley? Check out my review of another family friendly Fairmont Property: The Chateau Frontenac, Quebec City. I’ve never been to Boston but I would love to go. It sounds like there’s a lot for kids too, although if my eldest had his way we would never leave the aquarium! 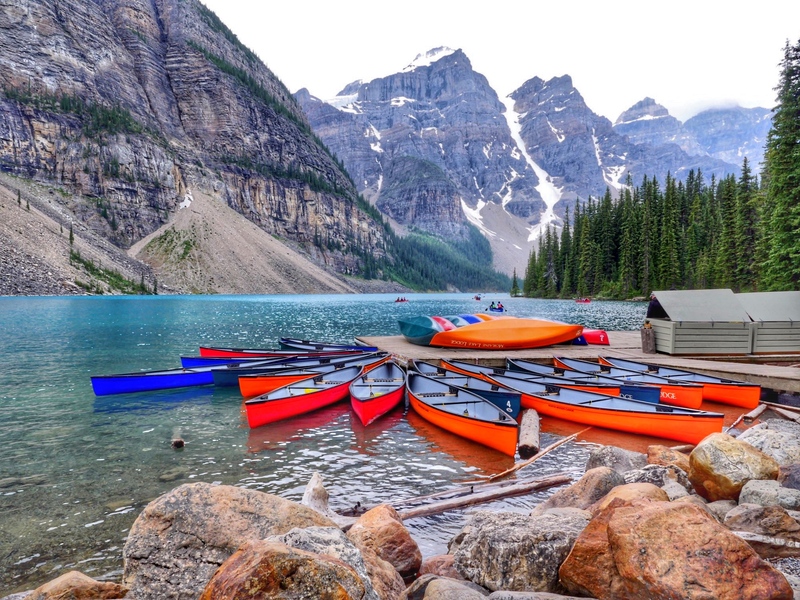 We’re staying at the Fairmont in Vancouver this summer so it was great to read how family-friendly this hotel group is. Thanks! A resident dog at the hotel? That is SO cool! Glad to hear you and Will enjoyed staying in Boston. I’ve never been inside the Fairmont. It’s good to know it’s kid friendly!